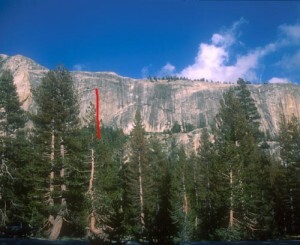 This is one of the few face climbs of its grade in Tuolumne with good protection. Crossing through the slab testpiece Slipstream (5.11c) on its third pitch, and neighbored by such climbs as the unfinished slab route Vapor Lock (5.11c), no one would expect this line to go at such a moderate rating. The first ascent team did not even intend to do this route, just to put a good anchor on the obvious fun crack at the start (D’oh! ), which previously had only a single hangerless 1/4” bolt as the anchor. Which SuperTopo guidebooks include a topo for Excellent, Smithers?